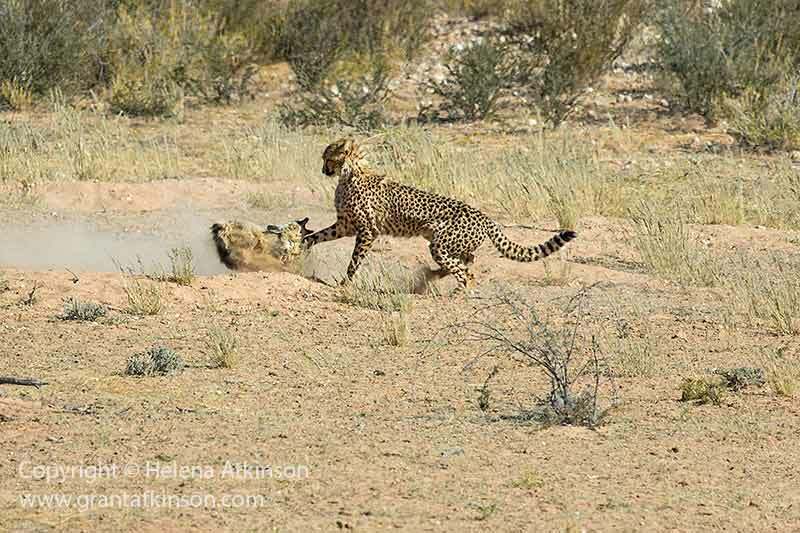 We were witness to a fascinating and exciting encounter between two subadult cheetah and a bat-eared fox during a recent visit to the Kgalagadi Transfrontier park. We had lost sight of a mother cheetah and her year-old offspring, both only a little smaller than she was, as they moved over a ridge. As we sat hoping to catch another glimpse of the cats, a bat-eared fox began running across the river bed, directly away from our vehicle, at full speed. At the same time we heard an animal making a loud distress call. Helena grabbed the binoculars and described what was happening. Across the river bed, the two young cheetah had cornered a bat-eared fox, and were attacking it. The fox we had seen was rushing toward the action, in an attempt to help its partner. Moments later, the bat-eared fox that was being attacked by the cats, broke away and ran down into the river bed, closer toward us. Helena exchanged binoculars for her Canon 5Dmk3 and 500mm lens, and began capturing the drama. All the images in this post were taken by her. The fox did not get too far before one of the cheetah caught up to it, and it was forced to stop and turn, in defence, rather than letting the cheetah attack from behind. Bat-eared fox are diminutive members of the canid family, weighing less than 5kg. They feed mostly on termites, supplemented by small rodents and birds. Although they are inoffensive and usually timid. This fox though, was doing everything it could, to fight off the cheetah. With teeth bared, and tail fur erected to make itself look larger, the fox was able to hold off the young cheetah. We could see marks on the bat-eared fox’s fur, from the cheetah’s earlier attacks. 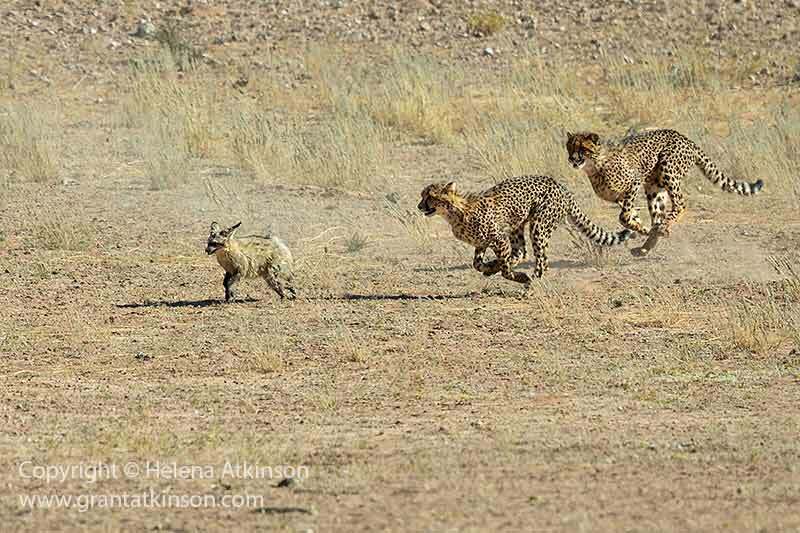 The balance tipped when the second young cheetah came charging in, and both cats set off in pursuit of the terrified fox, across the river bed. The second bat-eared fox that had alerted us to the happening, ran off at this point. 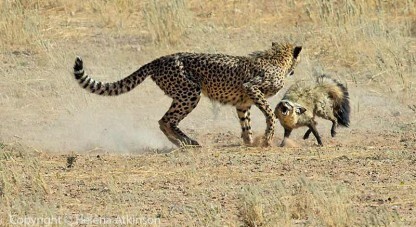 As the leading cheetah caught up with the fox, the smaller animal sank it’s teeth into the side of the cheetah’s face. The cheetah reared back, but only for a moment. Moments later, the second cheetah caught up, and together they immobilized the fox. Things were looking very bad for the fox, when one of the cheetah changed it’s grip from the fox’s ear, to a killing bite on the back of the smaller animal’s neck. The other cat had also moved in closer, and was biting on the foxes hindquarters. We stopped taking pictures. Next moment, something distracted one of the cheetah, perhaps a call from their mother, and it was enough to allow the fox to break free and dive into a nearby hole. The disappointed cheetah stood around for some time, peering inside the hole and even trying to climb inside, but to no avail. After about twenty minutes the cheetah gave up and walked away, following their mother. 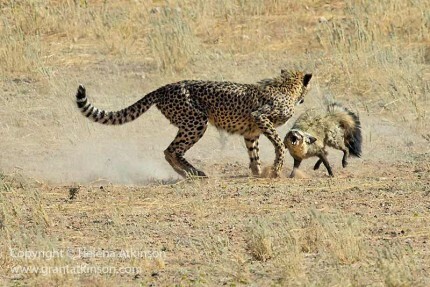 The inexperience of the young cheetah, along with the plucky defense put up by the bat-eared fox, had allowed it to survive. We had no idea how bad it’s injuries were. 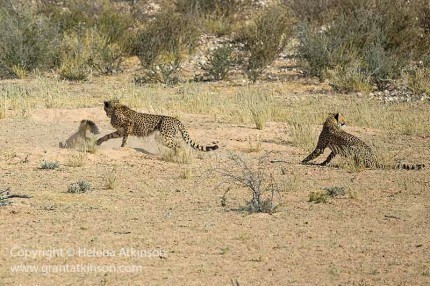 Whilst young cheetah are known to ‘learn’ how to hunt on smaller prey items or the young of larger antelope, those prey items are often caught by the mother first. 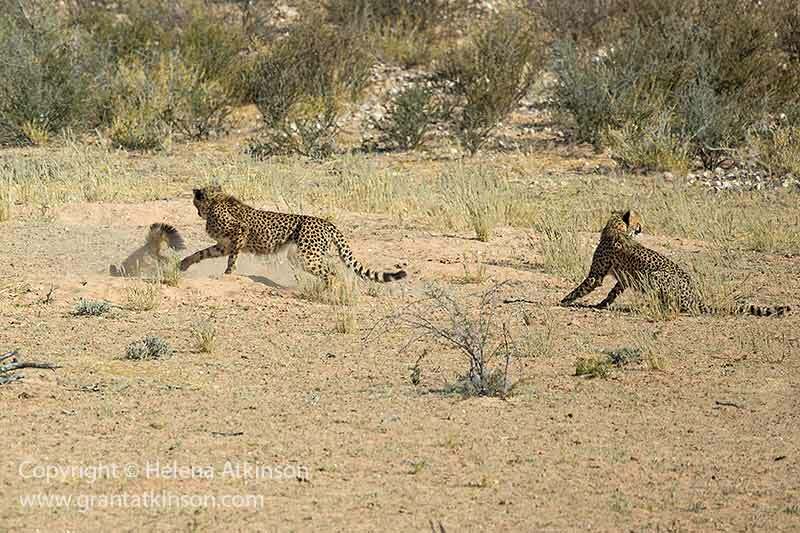 These two young cats had no help from their mother in this instance as she remained distant throughout the action. Whilst it is not typical of cheetah in general to kill other carnivores, they have been recorded before feeding on bat-eared foxes in the Kgalakgadi. 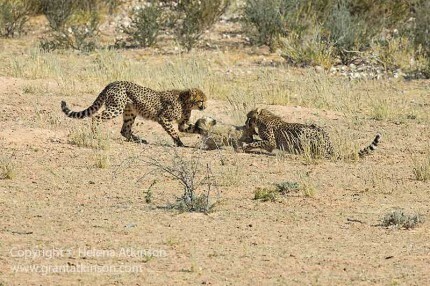 Later that same day the mother cheetah brought down a full-grown male springbok which was more than enough to feed all three of the hungry cats. Excellent story and images, Helena and Grant!! Thanks for sharing! congratulations to Helena and you!! Really great images!! What a lucky strike. This was such a photographic situation “Once in a life”, as we talked about in Kasane last October.. Compliments again. Fantastic, Grant and Helena. 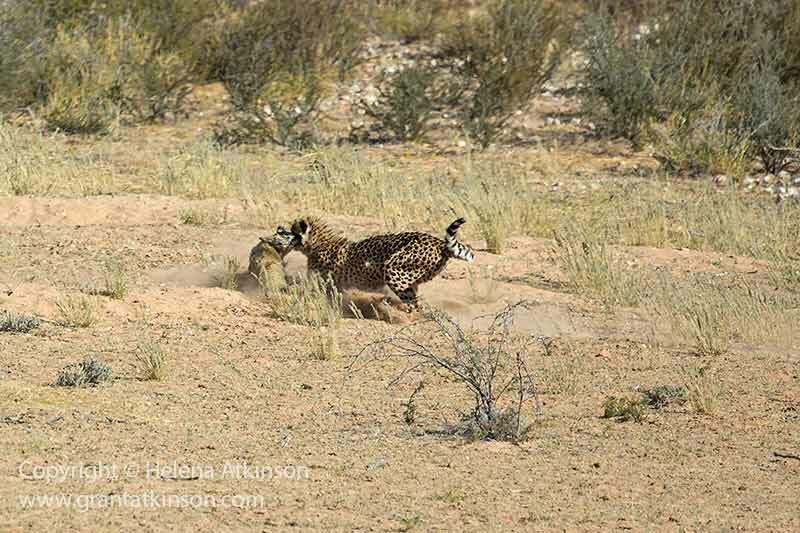 Ross, knowing our love for Kgalagadi, and many many camping visits, sent us web details, and I was holding my breath as saga unfolded, beautifully captured and SO THRILLED to hear the happy ending for game little fox. One trip, close to TR, a female leopard crossed the road in front of us, with a struggling bat-ear in its mouth. We shall never forget the terrible sound of the mate, screaming in river-bed. It went on and on. Our bat-ear wasn’t so fortunate.